Two activists should have been given legal aid in their long fight against a McDonald's libel action, a court says. The European Court of Human Rights said the lack of such aid effectively denied the pair the right to a fair trial. Helen Steel and David Morris, from north London, dubbed the "McLibel Two", were found guilty in a 1990s trial of libelling the company in a leaflet. England's libel laws may now be changed, although legal aid is now sometimes available in libel cases. 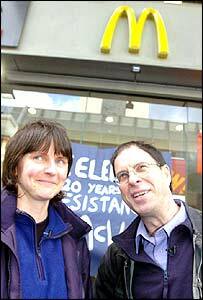 The original legal wrangle - the longest civil or criminal action in English legal history - was triggered when McDonald's sued former gardener Helen Steel, 39, and former postman David Morris, 50. The pair had been handing out leaflets containing numerous allegations about the corporation's policies and practices. Neither Ms Steel nor Mr Morris wrote the leaflets, but became embroiled in the libel action launched in 1990 and ending only in 1997 - with of 314 days spent in court. At the end of the case the High Court ruled McDonald's had been libelled and awarded the company £60,000 in damages, later reduced to £40,000 on appeal. But he found the leaflet was true in some aspects. The Strasbourg court's verdict is the end of a subsequent courtroom fight in which the activists accused the UK Government of breaching their human rights. The court ruled they did not receive a fair trial as guaranteed under the Human Rights Convention, because of the lack of legal aid available to libel defendants, and that their freedom of expression was violated by the 1997 judgement. The pair were awarded £24,000 damages, plus costs. Reacting to Tuesday's decision, a spokesman for the Department of Constitutional Affairs said: "We are studying the judgement very carefully." Recent changes in the law mean that legal aid is now sometimes available in exceptional libel cases. Libel lawyer Jeremy Clarke-Williams said the government would look at the libel laws in the wake of the decision "but I would be surprised if there were any changes as a result". He said the situation had changed since the case emerged in the 1990s. The cutback in legal aid and emergence of "no win no fee" agreements between lawyers and their clients had largely plugged the hole in provision which led to the action, he said. Joshua Rozenberg, legal editor of the Daily Telegraph, said: "I think the government will have to make legal aid available to people accused of libel who can't otherwise defend themselves. "The courts will not be able to order individual defendants to pay heavy damages to large corporations." Celebrating the decision outside a London McDonald's, Mr Morris said: "We believe in people power and we believe people should make the decisions themselves in their own communities." Ms Steel described the 15-year case as a "complete nightmare" but said it had been good to fight it. "Hopefully the government will be forced to change the law and that will mean greater freedom of speech," she said. McDonald's said it would not comment as it was not a party to the case. It said the libel trial related to practices in the 1980s and McDonald's had 'moved on' since then.